Bond no. 9's Andy Warhol Silver Factory is the first in a projected series of unisex fragrances created under an agreement with The Andy Warhol Foundation for the Visual Arts. The (perfect! I want one!) bottle design for Silver Factory was inspired by Warhol's 1965 series of Campbell Soup Can silkscreens, and the scent was named for Warhol's Manhattan studio, The Silver Factory, where the walls were decorated with aluminum foil and spray paint. Andy Warhol was said to be fond of perfume — he was reportedly buried with a bottle of Estee Lauder Beautiful — and there was until fairly recently an Andy Warhol branded line of fragrances (see a print ad here) under Cofinluxe. I never smelled any of the earlier Andy Warhol scents (please comment if you did!) but perfumer Aurelien Guichard has done a great job of creating something that might reasonably evoke the experimental pop culture atmosphere of the late 1960s while still smelling very much like a modern niche perfume. Silver Factory opens on citrus and lavender, lively, but still more soft than sharp (the complete notes: bergamot, grapefruit, lavender, violet, incense, jasmine, iris, amber, wood resin and cedar). The incense and woods are present from the start, and as advertised, a metallic note runs through the proceedings. There is something ever so slightly off-kilter (in a good way) about the early stages, maybe a touch of birch tar or leather? Patty at Perfume Posse calls it "metallic rubber". The florals in the heart are subtle; the cedar in the dry down, less so. After a couple hours, the iris seems to reassert itself, and it takes on a velvety finish with earthy undertones. It is more dry than sweet, and more dusky than dark. The softness of the opening sets the tone for what follows — Bond no. 9 calls it "smooth" and that is as good a description as any. There is nothing high-pitched or loud about Silver Factory, nor does it have the brooding, high-church feel of some incense-heavy fragrances. If Estee Lauder's Beautiful was representative of Andy Warhol's preferences in perfume, I don't think Silver Factory would be at all to his taste. Happily, it is very much to mine. It's easily the most interesting scent from Bond no. 9 since 2005's Chinatown (also Aurelien Guichard). Bond no. 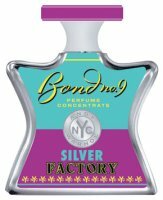 9 Andy Warhol Silver Factory will debut in December; 100 ml perfume concentrate (28% concentration) for $230. A second fragrance in the series is due to launch next spring. I just moo'd someone that I had no lemmings … and now this. And it really sounds good. M, not sure anyone who thought Chinatown was their best will change their minds, but since Chinatown doesn't suit me, this one is now my favorite Bond. Wheeee!!!! I am lemming this and the Goutals, and you said all the right things about this one. It sounds perfect. I am not an enormous fan of the Bonds (although I do like Chinatown and Noho), and this sounds like an interesting, wearable addition to the lineup. I don't pay much attention to bottle pricing since I mostly get decants, but isn't that on the spendy side for Bond? Or is that a bigger size? Or is $200 the new $100? oooh, thanks– i was out of town. these look yummy! I'm totally with you on this one. I'm not sure that a lot of Bond fans are going to be in love here, it's not really Bond'ish. Suits me to perfection, just in its weirdly wonderful jumble. Even if I hated the scent, I would totally have that bottle. That I love the jus is frosting on the cake. It is VERY expensive, although offhand don't remember the normal price for a 100. Presumably this would be more because of the higher concentration. Guessing I'll make do with a decant myself — I don't spend that much on perfume ever. It really isn't Bond-ish — it is interesting to wear this next to the Saks and see how nicely they dovetail with their presumed customer bases. So perhaps they'll go in a different direction w/ the Andy Warhol line, which seems appropriate. I guess if we really want to evoke AW though, we've all got to wear EL Beautiful, right? Just checked, they are mostly between $178-$190. But many of the others are available in 50 ml, and this one won't be (I think). You used to like it, right? I feel like I need to do re-evaluation posts on half of my early reviews. Oh, no…just as I was slouching back towards solvency…last night, after listening with aloof dignity as several relatives told me they find my *interest* in perfume a bit weird, I found myself wondering what grapefruit, lavender, violet, and incense would smell like together (yes, I'm a neophyte, please be patient with me)…oh dear, I will have to try this. Sounds wonderful, although these notes wouldn't make me think of AW at all (met him once at a party, but fleetingly), or his work. This is terribly distracting…I'm in the midst of joyfully exploring the Serge Lutens line. “Metallic rubber” sounds interesting. Good to see a Bond positively reviewed after a long time. So Bond no. 9 makes fragrances for entities in various industries now (Andy Warhol, Saks, Larry King..) ? How cool that you met AW, even briefly! I guess they're going to run out of NY neighborhoods eventually, right? They'll have to do something else. And perhaps the AW were shopping for another company if the earlier Cofinluxe scents didn't sell. I know there was one released as recently as 2005. Since I became a…what? perfumaholic?…Bond is one of the few lines from which I haven't yet found something I really love. Chinatown and I are not on speaking terms, and I had a brief flirtation with West Broadway and Bryant Park, but Silver Factory…WOW. I was lucky enough to get a sample, and your review does it great justice! The price is a bit hefty, but may well be worth it. And on another note, Laurice Rahme is supposed to be here in Atlanta on Oct. 6. I am thinking about going down to meet her, but it makes me feel a bit shy! Have you met her? Bond's style doesn't always suit me either. I do like Eau de NY, and thought Chinatown was extremely well done, just not “me”. Same goes for Bryant Park, and many of the others — well done, not me. The Andy Warhol might be the first thing they've done that is really right up my alley. I have not met Laurice Rahme, but know lots of people who have and all say she is charming. That's on the very short list of my claims to coolness, believe me :-). And yes, I am having a fine time getting to know Serge. Has he done anything with a coffee note? True…I guess I just want to honor my self-indulgent imagination ;D.
Don't think SL has done coffee (?) Certainly can't think of one. Have you tried CdG Kyoto? il Profumo also makes a Cafe Vert but haven't tried it. Yes, I got a sample of CdG Kyoto and love it — it's turning out to be my favorite of the series. Will try the Cafe Vert, it sounds interesting — thank you kindly, and I do love this blog (I have now ordered many samples based on your reviews, and not a bad one in the bunch!). Of the 6 Bond I own, Factory is my favorite. Of the over 100 fragrances I own, this is in my Top 5! I only about 4 months ago… started enjoying perfume. I am 41. Why it took me so long… I can't say? I know perfume seems to change my whole outlook where I do wear it….. anyway…. I know I don’t like fruity or flowery perfumes…. so far…. I know I do seem to like Amber. Well I was in Geneva and had a sales person look up ingredients to find a perfume with Amber. She pulled Silver Factory off the shelf. I fell in love with it. Then she turned it around and the store tag was over 300 Swiss Francs. I decided to look for it at a lower cost in the states. Here's the thing….. I don’t see this perfume on many web sites. Why is that? Did it not catch on? Where does Bond rate as a designer? Why is this perfume hard to find? Just a curious novice….. But will also add that the perfumes aren't cheap, and I've never seen them marked down. thx so much! just ordered it! Lucky you, enjoy your bottle! Just got my bottle of SF, and I can't get over how huge it seems after two 1.7 oz Bonds! I love the incense that I get all the way from the first spray to the reluctant shower, however, I recently picked up something which struck horror into my very nasal passages. I have been soft drink free for years now and suddenly I feel like fizzy drinks are stalking me. Still I love my Silver Factory and it seems to only happen when I'm thirsty. Next stop, Chinatown! I know I am late in the game here, but I just got a chance to smell this GREAT STUFF! Went into Saks for my favorite Bobbi Brown blush (called Pink Sugar, LOL!) and was offered a sample of the new Saks Bond (very fracas-y) and my eyes landed on the Silver Factory. I asked for a spray and LOVED IT…such a nice blend: soft incense. The SA could tell I was dead meat and sent me home with a sample. Oh well, the bottle is on the way. Ouch, this stuff is expensive, but it is divine. And 100ml is usually impossible but I have a feeling I am going to be lamenting its quick depletion…. So glad you happened upon it…I think it is definitely now my favorite Bond ever. SO wish they'd do a little 15 ml travel bottle! I only just had a chance to smell this! Pretty impressed actually! I'm not a cedarwood wearer so I won't be buying a full bottle of this one. But it is nice! Sounds like you need to go the decant route, maybe?